This space harkens back to a bygone era. Steel arches fabricated by Factotum Fabrication and Design; arch bases, Ativa Custom Design; pillbox seating, arched bar, Factotum Fabrication and Design; tile work, River City Tile Company; tile supplied by Daltile; granite countertop, Urban Granite; custom scent, Libertine Fragrance; tiger mural, AJA Louden; plywood supplied by Hardwoods Specialty Products. In the early 20th century, most of North America was, legally speaking, “dry,” as social and institutional pressure banished all drinking. Or at least, all drinking in public … sort of. It’s been said that during Prohibition, for every legal bar that was shut down, three more underground bars sprang up in its place. Regardless of the good or harm it may have caused, it created a culture and language that lives on to this day. The space welcomes you with the bar’s braided steel rods that jut out from the floor, rainbow overhead and reach the far wall lounge area, while extruded minimalist shapes and strong lines frame unadorned furniture and a large mural. It’s a stylish nod to the Prohibition-era workaround of customers paying to see a caged exotic animal and receiving a “complimentary beverage,” sometimes literally under the table. A circular window looks in from the street, giving passers-by a peek in and the space a VIP feel. An uncovered pendant light sets the subversive mood, lighting the pink and creamy tones that were pour painted on the seats, bar and walls. Or, in the parlance of that time: Vignettes is a place for people to scope out the scenes, see, a real nice joint, without any goons or grifters, where dames and cool cats can wear their glad rags and tip a few back — and it won’t cost them twenty large. When you’re there, make sure you gun for the speakeasy — it’s in the back, kind of off to the side. Ask for the “Blind Tiger.” But if someone starts speaking wise, or you feel any heat, tell them you don’t know nuthin’. A shadow coloured tufted sofa from Cottswood Interiors adds a refined style to any living space. $2,800. 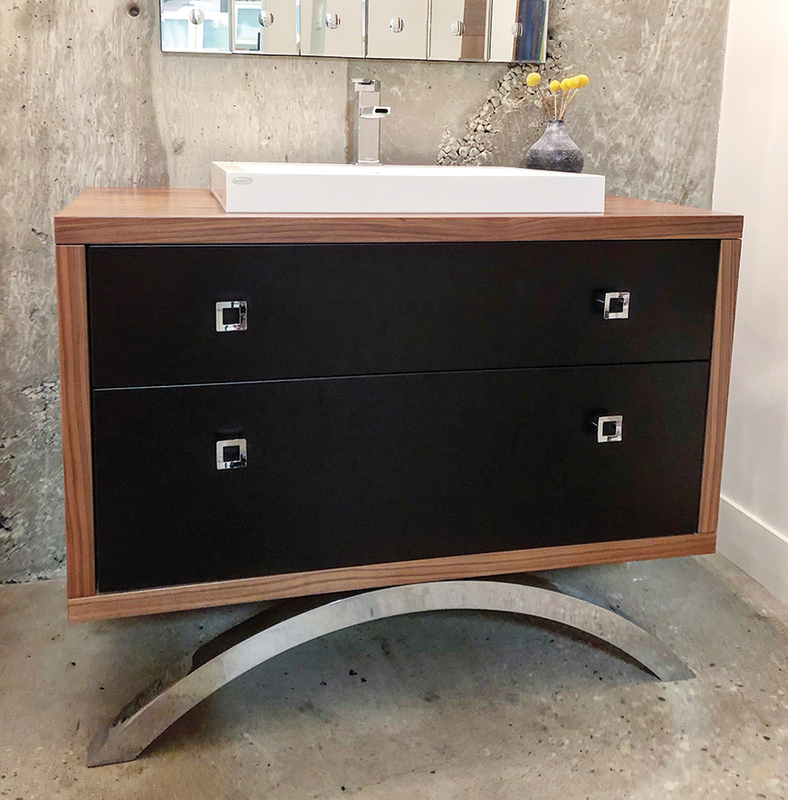 A metal on matte black, wood cabinet from Rëdl Kitchens gives your bathroom a touch of sophistication and cool. Price Upon Request. Make your bathroom magazine worthy with a regal claw-foot bathtub from The Ensuite. Price Upon Request.